Goodyear-welted men’s shoes, handcrafted in leather, often bear a higher price than low-quality shoes. However, what they boast in exchange is higher quality, breathability, durability, a comfortable footbed and ease of resoling. Welted footwear, also known as Goodyear-welted footwear, is the supreme discipline in shoe manufacture. These shoes satisfy the most discerning requirements of outstanding quality. High-quality materials, perfectly stitched with painstaking precision, offering great durability, the highest comfort and an ease of resoling that prolongs their lifetime. Each pair of Goodyear-welted shoes is a fine example of the art of shoemaking. While poor-quality products are made with a fully automated process, all of our high-class men’s shoes are handcrafted, using one of the oldest methods of traditional footwear manufacture. These shoes are much more than common everyday objects – simply put, Goodyear-welted shoes are works of art. We boast the most highly sought after leather in the world, including box calf, French calf, outsole from Rendenbach and cordovan from Horween. Tanned in France, all of our leathers are skin-friendly, underpinning the exceptional characteristics of our first-class shoes: a fashionable appearance, pleasant odour and durability are guaranteed. Our exotic leather fulfils the Convention on International Trade in Endangered Species of Wild Fauna and Flora (CITES). The high quality of our shoes is reflected in the high leather content. Shoe upper, inner lining, insole and outsole are all made of finest leather. With our customary attention to detail, even the heel is made of separate leather layers – a rarity in the world of shoes. Poor-quality shoes consists of rubber, ours are made of leather. Each shoe consists of 65 separate parts, crafted in the traditional Goodyear-welted method. In total, around 210 skilled operations are used to produce each one of our men’s shoes. All shoes benefit from the knowledge of experienced shoemakers and high-grade materials. All together, our shoes promise the highest quality. Our first-class footwear consists of high-quality leather. This natural and breathable material promises great air circulation. Moist feet are almost impossible with our Goodyear-welted shoes, which will make a positive contribution to your foot health. Designed in Berlin, all of our shoes are produced in our Spanish shoe manufacture. Experienced master craftsmen work together to produce shoes to our stringent quality standards. It takes three to four days to create just one pair of our Goodyear-welted shoes. Before you get your new pair of shoes, an elaborate hand finish gives the footwear a vivid appearance. The leather will be refined and receives their final gloss. To maintain their original beauty, all of our shoes are sent in an extra shoe bag. 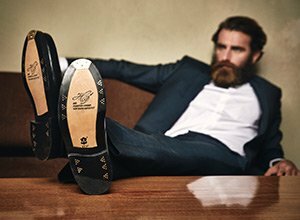 In another nod to detail, all of our shoes are equipped with a so-called gentleman’s corner. This small notch cut out of one of the heel’s corners, prevents you from catching the fringe of your trousers on your shoes. As an online company we guarantee an effective distribution system thanks to a low cost structure and a wide coverage. By cutting out the middleman and no paying for a brand name we pass on the cost savings directly to our customers and offer an incomparably fair price for Goodyear-welted full leather shoes. We only use materials that have been sourced and processed in the EU. Whether it’s vegetable-tanned sole leather from the Rendenbach companyin Trier, gently tanned French calf from France, or the work of our shoemakers in Spain, who evince a great love of detail—our production chain is fully transparent. We care for the environment as well as for our fellow man.